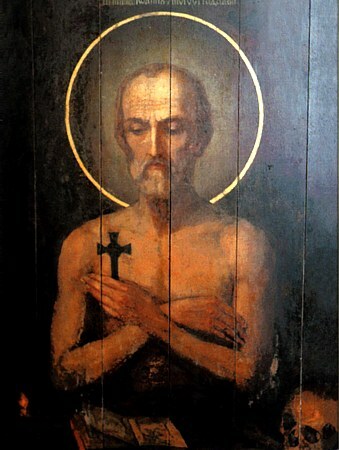 The Monk John the Much-Suffering, of Pechersk, pursued asceticism at the Kievo-Pechersk Lavra. The ascetic related, that from the time of his youth he had suffered much, tormented by fleshly lust, and nothing could deliver him from it – neither hunger nor thirst nor heavy chains. The monk then went into the cave wherein rested the relics of the Monk Antonii, and he fervently prayed to the holy abba. After a day and a night the much-suffering John heard a voice: "John! It is necessary for thee to here seclude thyself, so that at least to weaken the vexation by silence and the unseen, and the Lord shalt help thee through the prayers of His monastic saints". The saint settled into the cave from that time, and only after thirty years did he conquer the fleshly passions. Tense and fierce was the struggle upon the thorny way on which the monk went to victory. Sometimes the desire took hold of him to forsake his seclusion, but then he resolved on still greater an effort. The holy warrior of Christ dug out a pit and with the onset of Great Lent he climbed into it, and he covered himself up to the shoulders with ground. The whole of Lent he spent in such a position, but the burning of his former passions did not quit his much-exerted flesh. The enemy of salvation brought terror upon the ascetic, in wanting to expel him from the cave: a fearsome serpent, breathing fire and strewn with sparks, tried to swallow the saint. For several days these evil doings continued. On the night of the Resurrection of Christ the serpent seized the head of the monk in its jaws. Then Saint John cried out from the depths of his heart: "O Lord my God and my Saviour!Wherefore hast Thou forsaken me? Have mercy upon me, Thou Only Lover-of-Mankind; deliver me from my foul iniquity, so that I wither not in the snares of the malevolent one; deliver me from the mouth of mine enemy: send down a lightning-flash and drive it away". Suddenly a bolt of lightning flashed, and the serpent vanished. A Divine light shone upon the ascetic, and a Voice was heard: "John! Here is the help for thee; henceforth be attentive, that nothing worse happen to thee and that thou suffer not in the age to come". The saint prostrated himself and said: "Lord! Why didst Thou leave me for so long in torment?" "For the power of thine endurance, – was the answer, – I brought upon thee temptation, so that thou might be smelted pure like gold; it is to the strong and powerful servants that a master doth assign the heavy work, and to the infirm and to the weak – the easy tasks; wherefore pray thou to the one buried here (the Monk Joseph the Hungarian), he can help thee in this struggle: he even moreso than Joseph (the Handsome)". The monk died in about the year 1160, having acquired grace against profligate passions. His holy relics rest within the Antoniev Caves.